Today, the EUSA Executive Committee meeting 01-2010 officially concluded. In the morning, the EC members were welcomed by Mr. Gintaras Steponavicius, the Lithuanian Minister of Education and Science. 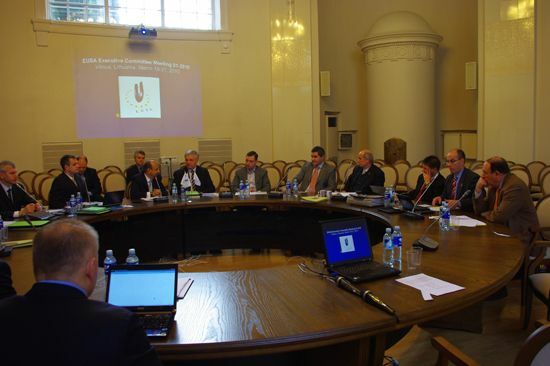 Apart from finishing the items on the agenda of the meeting, March 20, 2010 will have a special meaning for the European University Sport. 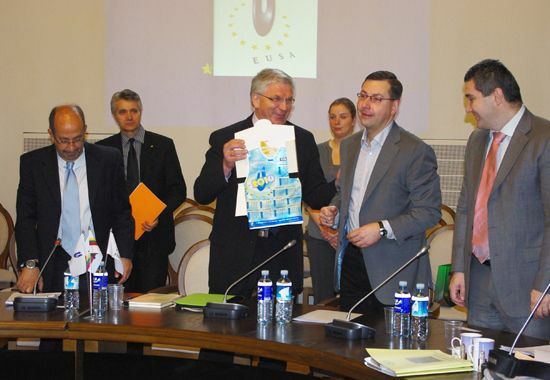 Today, the First European Universities Games, to be held in 2012 were attributed. The bidding cities – Lisbon (POR), Cordoba (ESP) and Lodz (POL) in details presented their candidatures to the members of the EUSA EC members. The idea of hosting a multi-sport university event in 2012, bringing together European university teams from several sports at the same time was very appealing for all candidates, which all presented excellent bids. Due to the high interest, the possibility of increasing the predicted 5 sports was discussed. The Games could therefore offer the participation of students, competing in up to 10 sports. After the presentations, the bidding committee representatives had the chance to answer questions of the EUSA EC members, and after the discussion, EC members voted on the organiser of the Games. It is with our great pleasure to announce that the European Universities Games in 2012 will be organised in Cordoba, Spain. On behalf of the Bidding Committee, Mr. José Manuel Roldán Nogueras, the Rector of the University of Cordoba expressed thanks for the entrusted organisation of the Games, and expressed his strong belief that the European Universities Games in Cordoba will be very successful. Mr Gualtieri congratulated the winners on behalf the EUSA EC, and thanked the other two bidding committees for the excellent bids. After the meeting ended, the EUSA EC members and representatives of the bidding committees enjoyed the sightseeing tour of Vilnius. As a conclusion of the EUSA EC Meeting in Vilnius, a formal joint dinner was organised, with several prominent guests from Lithuania, including Ritas Vaiginas, General Director of the Department of Physical Education and Sports; Algimantas Gudiskis, representative of the Lithuanian Olympic Committee; Povilas Karoblis - President of Lithuanian Olympic Academy; Romualdas Ginevicius, President of Lithuanian Rectors Conference; Albertas Skurvydas, Rector of Lithuanian Academy of Physical Education and others. At the dinner, Mr Gualtieri was presented a special recognition of the Lithuanian Academy of Physical Education for his work – the Conferement of the degree of Doctor Honoris Causa; which will officially be awarded at a special ceremony in May 2011. Mr Gualtieri sincerely thanked Mr Albertas Skurvydas for this great honour, and also expressed the gratitude on behalf of EUSA to Mr Ceslovas Garbaliauskas, the President of the Lithuanian Students’ Sports Association for his hospitality and the excellent organisation of the EUSA EC Meeting in Vilnius. EUSA EC members will next meet in Ljubljana (SLO) on September 24 and 25, 2010.